As a kid growing up in the suburbs of Boston, we often drove into the city, and a highlight of the ride was passing by the oil tank on the Southeast Expressway covered with splashes of paint in the colors of the rainbow. Initially, I had imagined that some renegade had poured buckets of paint over the top, allowing it to drip down the sides in random rivulets. It was only later that I learned that it was the creation of artist Corita Kent, which I found confusing and a challenge to my idea of what constitutes art (including my Type-A inclination towards symmetry). When my mother, educated from cradle to college by nuns, told me with pride that Kent herself a Catholic sister, it only made the work seem more remarkable, shocking and, yes, inspired. So began my fascination with public art – both those that are commissioned (like Kent’s) and those that surreptitiously appear on the sides of buildings, in subway tunnels, under bridges, and sometimes even on trash dumpsters (see below). I’m talking about graffiti, of course. When in Seattle this week for the INTA conference, I saw a number of excellent examples of graffiti (some of them, if I am not mistaken, with a decidedly grunge vibe to them). This reminded me of two recent graffiti infringement cases that are worth considering in tandem. And it reminded me also of Snoopy. The first case was brought by artist Itoffee R. Gayle who objected to the appearance of graffiti he created in an episode of HBO’s series Vinyl. In the challenged scene, one of the actors walks by a dumpster on which Gayle had tagged graffiti consisting of the phrase “art we all.” Gayle alleged in his pro se complaint that HBO’s use of his work was a “calculated & coordinated” attempt to make the depiction “more authentic to viewers.” For support, he cited a YouTube video in which the series’ production staff talk about the importance of graffiti in recreating the gritty 1970s-era New York City, the setting for the series. Gayle sued for copyright infringement, unfair competition, and trademark infringement. Earlier this month, the district court dismissed all of Gayle’s claims. With respect to his copyright claim, the court held that the use in question was de minimis – in other words, so trivial as to either “fall below the quantitative threshold of substantial similarity” or otherwise to be without legal consequence. When analyzing whether a use is de minimis, the key question is the observability of the work, including the length of time the work can be seen and its prominence, based on factors such as focus, lighting and camera angles. Here, the court found the graffiti was “never fully visible, let alone legible,” even when the video was paused, because it appeared on screen for less than three seconds, in the background, at an oblique angle, and in low, uneven light. For similar reasons, the court dismissed the trademark and unfair competition claims: if a viewer would have difficulty picking out the graffiti (including Gayle’s alleged trademark) in the scene, the viewer was not likely to believe that Gayle authorized or approved the use or had any affiliation with HBO or the series. Gayle v. Home Box Office, 17-CV-5867 (JMF) (S.D.N.Y. May 1, 2018). In the Gayle case, the court assumed that the graffiti was protected under copyright. A case that made headlines in March squarely raised the question of whether graffiti is protectable under copyright law in the first place. In that case, a graffiti mural by artist Jason Williams, a.k.a Revok, was included in an ad campaign for H&M. H&M used the mural without authorization from the artist. However, the mural was painted on a hand ball wall in a NYC park without authorization from the owner of the property (NYC). After receiving a cease and desist from Williams’ lawyer, H&M sued in federal court seeking a declaration that any claim of copyright infringement by Williams was “barred under the defenses of illegality and/or unclean hands” because the creation of the work constituted an act of vandalism. After a public uproar, H&M announced via a tweet that it would voluntarily withdraw the complaint and pursue resolution directly with the artist. Brands and agencies know that shooting on location, especially on the busy streets of a city like New York, can present clearance challenges. Graffiti is just one of them. Consider Times Square as an example. You are surrounded by posters, billboards and other copyrightable works. There are third party trademarks and logos. There are model and celebrity likenesses plastered on the sides of buildings. And there are pedestrians who, in flagrant disregard to the production assistants’ entreaties, insist on walking directly in shot lines. You can minimize issues by framing shots with care. Post production magic can make some problems go away (although that can be expensive). And securing permission is always an option. Of course, when it comes to graffiti, securing permission can be tricky – not all artists take credit for their work, and even those that do often use sobriquets and are not easy to track down. Finally, Snoopy. I recently had an opportunity to attend the opening of the Peanuts Global Artist Collective installation in NYC, a public art installation happening in seven cities across the globe. In New York, hand painted murals based on the designs of seven artist appear on brick walls and garage doors in the Hudson Square neighborhood. 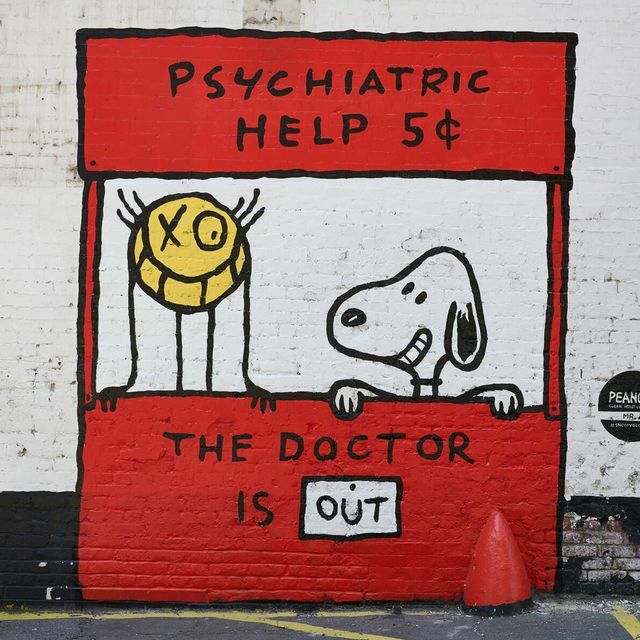 The artists and their (re)interpretation of the Peanuts characters we all love, when viewed in the context of a somewhat gritty, commercial neighborhood in the greatest city on the planet, is beyond cool. So, it you find yourself in NYC through July, I highly recommend you check them out.